Everton kick off the new Premier League season with a trip to face last season’s runaway Championship winners, Leicester City. The East Midlanders finally delivered on years of promise to earn promotion back to the Premier League after an 11 year absence, which even saw the foxes drop to an all-time low, with one season in English football’s third tier. It is always difficult to take on a newly promoted side at the beginning of the season, particularly one who have become accustomed to winning so many football matches, but what have Everton got to contend with on Saturday? What have we got to worry about? Leicester’s most famous name is between the sticks, with former Manchester City goalkeeper, Kasper Schmeichel hoping to emulate his fantastic father and make an impact on the Premier League. The 27 year old is now a full Danish international and played against England at Wembley Stadium in last season’s meeting between the two nations. Schmeichel kept an impressive 17 cleansheets in the league last season and was the solid foundation on which Nigel Pearson built his Leicester team. In defence Leicester are led by their skipper, Wes Morgan. The former Nottingham Forest centre back is big and powerful, but it is open to question as to whether he is capable of making the step up to the Premier League. It is with great surprise that Pearson hasn’t looked to strengthen at the back. Last season’s regular back four of De Laet, Konchesky (on my!!! ), Morgan and the highly rated Moore will do well to make the step up to the level required in the Premier League, the only defensive arrival is former England international Matthew Upson who has looked well past his best in recent seasons. Leicester young vibrant midfield is probably their strongest unit and Everton will need to be watchful of French winger, Anthony Knockaert if he is passed fit to play. The pacey and tricky u21 international has a fantastic shot and Everton will need to be aware of conceding free kicks within 30 yards of goal. In the centre of midfield Danny Drinkwater is Leicester’s playmaker. The former Manchester United trainee is integral to Leicester and after he was named in the Championship team of the season, the club moved quickly to tie him down to a new 4 year contract. The Foxes attack is led by summer signing Leonardo Ulloa. The Argentine arrived from Brighton for a club record £8m, a fee which could increase to £10m if Leicester remain in the Premier League beyond this season. Ulloa will be under significant pressure to perform at the top level and despite scoring just under a goal every 2 games for Brighton, their remains significant question marks over the qualities of the former San Lorenzo striker. The battle to play alongside Ulloa will be between James Vardy and David Nugent. The pair scored 36 goals between them last season, but over half of Nugent’s 20 goals came from the Penalty spot, a record that he is unlikely to repeat in the Premier League. Leciester City: Schmeichel; De Laet, Moore, Morgan, Konchesky; Mahrez, Drinkwater, James, Knockaert; Ulloa, Nugent. 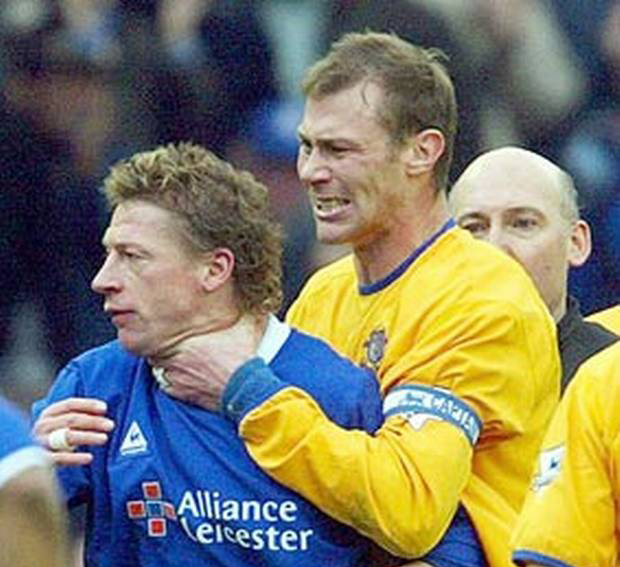 Several players have played for both Leicester City and Everton. The most famous of them all is undoubtedly Gary Lineker. Born in Leicester, the Match of the Day host began his career at his home town club before moving to Goodison Park in 1985. One season and 40 goals later, Lineker was off to Barcelona but he made a significant impact on Merseyside despite his short stay. Ian Wilson arrived at Goodison from Leicester during the 1987-88 season. The left winger always struggled for popularity on Merseyside as he acted as understudy to the brilliant Kevin Sheedy. Ian Marshall enjoyed the best years of his career at Leicester. The former Everton youngster joined the Foxes from Oldham and his versatility and his ability to play at the back or up front made him a success at Filbert Street. With his scruffy appearance and ungainly playing style he did not appear to be a natural athlete, but he was effective and knew how to play within his limitations. Last time Leicester were in the top flight they signed Marcus Bent on loan from Ipswich Town and the journeyman footballer contributed with 9 league goals including a last minute equaliser against the Toffees. Bent then signed for Everton the following season and was surprisingly instrumental in helping the Blues secure a 4th place finish in the Premier League. A quick look at the brilliant Everton Results provides a surprising insight into the history of this fixture. Although Everton have the edge in previous encounters between the sides, the record is much closer than one would imagine. This will be the 100th match between the two sides, with Eveton wining 38 to Leicester’s 31. The remaining 30 matches have ended all square. Everton have only visited the Walker’s (King Power) Stadium once before, with the game ending 1-1. In fact the last 4 meetings in Leciester have ended all square, with Everton’s last win at Leicester as far back as the 1997-98 season, with Gary Speed scoring the winner from the penalty spot. Our archive footage this week comes from the 1968 FA Cup Sixth Round match between Leicester City and Everton at Filbert Street. Keep an eye out for a fantastic finish from Howard Kendall to put Everton 2-1 ahead in a match that eventually finished 3-1 to the Toffees.